"I decided to make a quiche so I could have something delicious to eat in the mornings for breakfast. I searched the web and found a few quiche recipes and then adapted my own from the basic ingredients. This was, to my surprise, super easy AND super delicious. Use lactose-free margarine instead of olive oil if desired, and jalapeno yogurt cheese, goat-milk Cheddar, or some combination. Enjoy!" Heat 1 1/2 teaspoon olive oil in a nonstick oven-safe skillet over medium heat; cook and stir green onions and garlic in the hot oil until the garlic is fragrant but not browned, about 1 minute. Stir in spinach, cover skillet, and cook until spinach is wilted, about 5 minutes. Transfer spinach to a large bowl. Heat 1 1/2 teaspoon olive oil in same skillet and turn heat to medium-high. Cook and stir mushrooms until lightly browned, about 5 minutes; remove from heat. Squeeze any moisture from spinach mixture and stir into mushrooms. Beat eggs in a bowl until thoroughly combined. 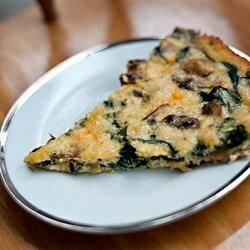 Stir eggs into the spinach-mushroom mixture; thoroughly stir in feta and jalapeno yogurt cheeses. Spoon the mixture back into the skillet; use a spoon to level surface. Wipe any filling from edge of skillet above the filling with a paper towel. Bake in the preheated oven until the quiche is golden brown, about 45 minutes. Let cool slightly before cutting into slices. I doubled the recipe and cooked it in a 9x13 casserole dish. It was the first thing all gone from the brunch table at our retreat. I used feta and cheddar cheese instead of the yogurt cheese. Great recipe!! Only thing I would change is the name. A crustless quiche is a frittata. Thanks for the wonderful recipe! Feta cheese with either pepper jack, cheddar, even mozzarella. To make it a little spicier, add either roasted hot peppers or the oil used to roast hot peppers. This was my first try for anything quichey. I decided to do my own spin on it and use mozzarella with spinach, mushrooms, and a cracker crumb crust. It was - is - absolutely delicious.